The Editorial Board is very committed to build the Journal as one of the leading international journals in biological sciences in the next few years. 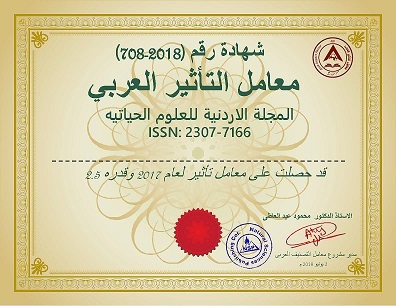 With the support of the Ministry of Higher Education and Scientific Research and Jordanian Universities, it is expected that a heavy resource to be channeled into the Journal to establish its international reputation. The first issue of the journal appears in early 2008 with four issues per year. 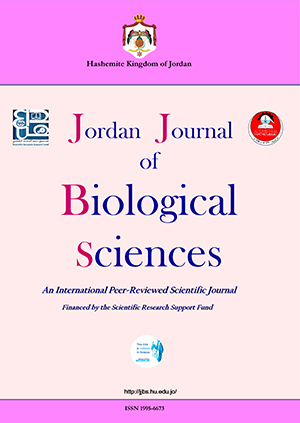 Jordan Journal of Biological Sciences (JJBS) aims to provide a forum for a broad blend of scientific and technical papers to reflect the evolving needs of the biological sciences. Mainly welcome are contributions dealing with cell biology, genomics, microbiology, immunology, molecular biology, biochemistry, embryology, immunogenetics, cell and tissue culture, molecular ecology, genetic engineering and biological engineering, bioremediation and biodegradation, bioinformatics, biotechnology regulations, gene therapy, organismal biology, microbial and environmental biotechnology, marine sciences. The JJBS welcomes the submission of manuscript that meets the general criteria of significance and academic excellence. All articles published in JJBS are peer-reviewed. · Prof. Bamburg, James, Colorado State University, U.S.A.
· Prof. Garrick, Michael D, State University of New York at Buffalo, U.S.A.
· Prof. Ghannoum, Mahmoud A., University Hospital of Cleveland and Case Western Reserve University, U.S.A.
· Prof. Gurib-Fakim, Ameenah F, Center for Phytotherapy and Research,Ebene,Mauritius. · Prof. Hanawalt ,Philip C,Department of Biological Sciences, Stanford University Stanford , U.S.A.
· Prof. Kilbane, John J., Program Manager and Sr. Petroleum Microbiologist, Intertek, Houston, Texas, U.S.A.
· Prof. Schatten, Gerald, Director Pittsburgh Development Center Director, Division of Developmental & Regenerative Medicine Professor of Ob-Gyn-Repro Sci & Cell Biology & of Bioengineering; UP Cancer Institute; University of Pittsburgh School of Medicine,U.S.A. Prof. Abu-Elteen, Khaled Husein, Ph.D.